Larger Drone (and other) Lipo Batteries could bring down a plane. They contain a LOT of energy. 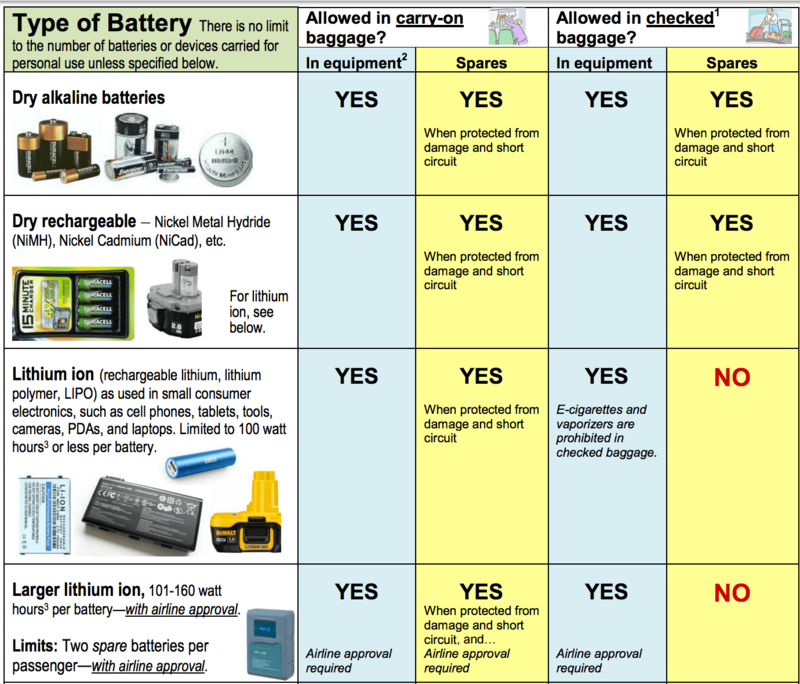 Please – do not check luggage or cases with your drone batteries – either as regular checked baggage or as “gate check”. Doing so endangers life and property (including your own family). The big NO in the right column of this chart says it all. You cannot check “spares” – meaning 2nd or loose batteries. It is legal (see the docs) to check a single battery installed in a consumer device. However – keep this in mind. Many Drones are not “tested consumer devices” – and even an installed battery could be dangerous. My own preference (when I travel) is to either carry everything on or ship it ahead. Your convenience and/or saving money is not as important as safety. These things are a matter of percentages – sooner or later (there are already records of drone battery fires on aircraft) an aircraft will be brought down. I am posting this notice since I have recently read forum postings where pilots discuss gate checking their BIG Lipos….and no one mentions the safety aspect. Enjoy the Holidays and Stay Safe. FAA Basic Chart – Educate Yourself! The UDI 818 has always been one of our suggested drones for beginners – however, we have based this recommendation on experiences of others, price and other factors. Having never actually flown the model I was happy when a review model was offered to use by Usatoyz, a prime seller on Amazon. The UDI 818 can be found for as little as $50 and as much as $100+…this brings up the question of what the differences are. Well, some are just overpriced – I found the same model I received for $150 on Amazon (another seller), whereas the FPV model we flew was on sale at less than $95. DJI Mavic Pro Launched – Headset, Folding, 4K Camera Drone! Pre-order your DJI Mavic now at this link – Shipping Mid-October! Amazon now also is taking orders for the Mavic Pro with shipment at end of October. Images at the bottom of this post. Note – we were in NYC for the launch and also had a hands-off (flight time) with the Mavic. Some of our pictures are at the very bottom of this post below the DJI Stock Images. DJI now has full information and specs at their web site on the Mavic Pro. Introducing the Mavic Pro – a portable, powerful, easy-to-use drone featuring DJI’s most innovative camera and flight technology in a sleek, foldable package that enables creative fun wherever you go. Another post on Droneflyers.com (here) contains the full press release, pictures as well as prices and specs. The drone world is abuzz with talk and speculation about an upcoming DJI drone, reportedly called the Mavic Pro. Leaked images along with a scheduled DJI Event in NYC (Droneflyers.com will be there!) indicate the introduction of a new product line which is foldable and compact – and yet has advanced features. Launch Day – We will know all in a few hours. Here is a videos shared on RCgroups – we have no idea of the source of this video (if it works at all). Some of the “leaked” images and renderings are below. We could make some guesses as to the price and capabilities but, at this point, Tuesday is coming soon so we will simply update this article when we get our hands on the Real Thing. A discussion thread in our forums will allow for a continuous back and forth for those who buy, fly or have questions about this model. After many delays, GoPro today announced their Karma Drone. Here is a great post on RCG which shows the basics – the beauty of this drone is that it comes with a full package including a backpack and a hand-held camera stabilizer (mount for gimbal)….so the GoPro fan or owner can have a complete setup for both ground and aerial photography. GoPro also introduced two new cameras – the hero5 and the Session5. Karma is slated to ship Oct 23rd. As usual, we caution most drone shoppers to wait until the unit is shipping for a month (or 3) before deciding on a purchase. This will also allow you to read the various reviews that follow the initial launch. We will update this article with opinions, reviews and links. Note – DJI is slated to release a new Drone next Tuesday (9/27) in New York City. Rumor has it that it will also be a compact and foldable model – named the Mavic. Droneflyers.com will be at the launch event and report on the new DJI model ASAP.